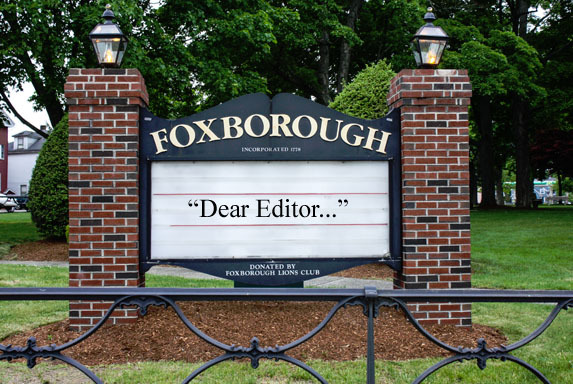 The Foxboro town election is over, and as usual, the campaigns were exciting, controversial, and filled the Reporter and its companion web site with letters, editorials, and columns, as another election cycle splashed across these pages. Regardless of its outcome, the recent election cycle and voter turnout proves yet again that residents DO care about Foxboro and town government. While I will not comment on any of the words that have appeared in the Reporter, there is no denying that the writers believed what they wrote, and were passionate about getting that particular opinion out. I respect whenever people write into a local paper. For a while, the passionate discussion of town affairs extended to the ability to comment anonymously on the Reporter’s web site. But unfortunately, insightful, interesting discussion and debate was often (read: always) sabotaged by a select few who resorted to name calling, accusation, and page-long screeds and streams of consciousness that seemed to be nothing more than a childish rant, bereft of even a breadcrumb of fact. Because of this, I applauded the Foxboro Reporter’s decision to remove its comments section from its web site. But the removal of the comment ability HAS reduced the local dialogue, and that’s why I write these words today. The election is over, and if history repeats itself, the letters to the editor will dry up to a few each week. But the things that matter to this town are not limited to expression during a few short weeks a year. There are 17,000 of us in Foxboro and a huge percentage of that number are adults who pay taxes and vote. Surely there are things you want to say. Do you have an opinion about your child’s school? The sewer system? Route One expansion? Taxes? Town policy about some matter? Trash stickers? Use of town resources? Town management? Anything to do with Foxboro issues? Did you watch a meeting and something bothered or impressed you? Did you witness something in town you want to share? Is there something you feel passionately about? Then make yourself heard. Write a letter to the editor. I would love to see the Reporter filled with guest columns, letters, and opinion pieces by YOU. Let’s see a continuing real dialogue – whatever your opinion – here on these pages. Write your words, sign your name, and send it in. It’s easy to give oneself an alias and trash talk all over a blog. But to sign your name to a letter and send it in for all to see, that takes character. Speak up — Real change is made when many opinions are offered. Real dialogue is possible when many voices are heard. THAT contributes to real progress. Everyone has a right to be heard, to make their opinion known, to contribute to the discussion, so the best decision can be made. Be part of the solution. Write your letter today. We look forward to reading it, and discussing it. Another Slow News Day! → ← More Silver Age Superboy antics: No matter where you look, there’s the Earth.